Form, function and versatility. 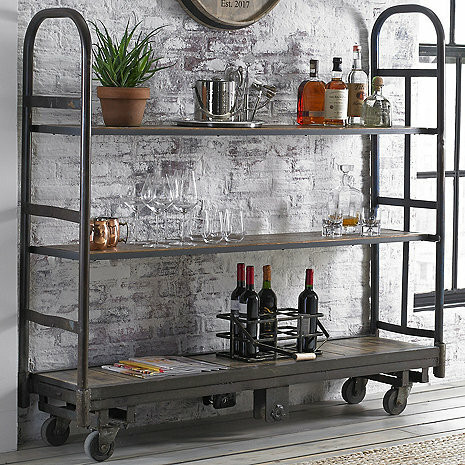 Handcrafted from restored vintage factory carts with ample storage for any room in your home. Use it for plates and cookware in the kitchen, stemware and wine bottles in your home bar or even books and picture frames in the family room or den. Vintage steel and reclaimed oak sit on 4 heavy duty castor wheels. All shelves are trimmed with a protective metal frame. Handmade from recycled materials, no two pieces alike. Your description states there are 4 shelves, but only 3 are displayed. Where is the 4th shelf and where would it be placed? BEST ANSWER: The Shelving Cart with Castors has three shelves.